The story of the binding of Isaac stretches me beyond my comfort zone. We’ve considered the faithfulness of Father Abraham on his journey of faith and we’ve been impressed by his commitment to follow God, to trust and obey. But this? Who is this God who would ask such a thing? Who is this father who would do such a thing? Who is this beloved son who would give himself willingly – and why? Within the Islamic tradition, it was Abraham’s son Ishmael who submitted to this binding, so here is an excellent opportunity to take the Bible seriously without taking it literally. This story is true; it tells us something deeply true about God and ourselves and our relationship to God. The story is true even if it is told differently in different traditions. The story is true even if it never actually happened in history. 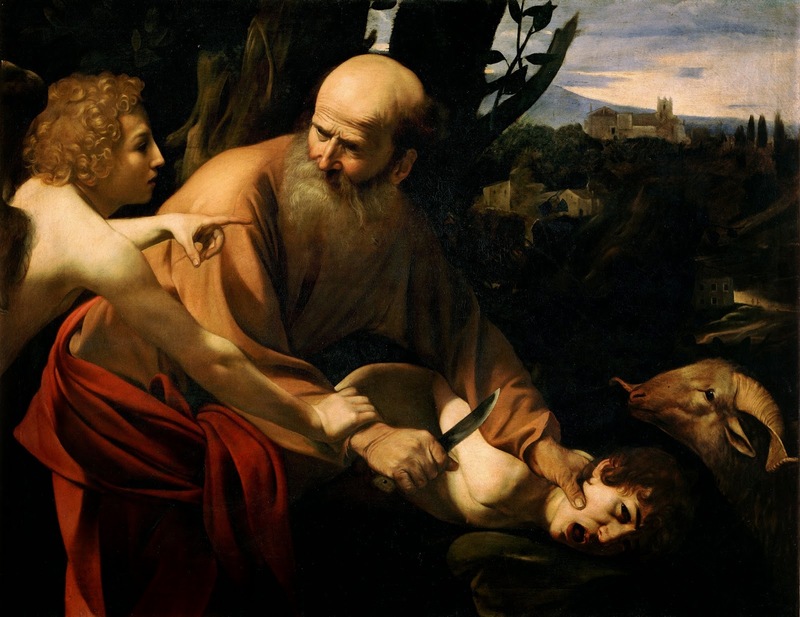 In Abraham’s culture (and among some people today) a man’s descendants ensured that his life would live on. But if Abraham followed God’s call this time, it would mean he was sacrificing not only this son whom he loved, but also his hope that his own life would have meaning and continue within his descendants. So here is a story that speaks to the very real possibility of complete annihilation and extinction, not only of Abraham and his descendants but also of God’s own promise. This story about Abraham’s faithfulness to obey such a drastic call gives new meaning to the depth of his trust. Abraham’s is a faith so grounded in the faithfulness of God that he believed God’s promise could never be annulled. I think of all the things I cling to so dearly, that define my identity and my worth. I think of all the people who are so precious to me and how very hard it is to let go of my expectations, to release control, to give myself and my beloveds over to the One Who is Creator-Redeemer-Sustainer. This kind of trust/distrust was the primal temptation in the Garden, I believe. The fear to entrust ourselves to our Creator continues to be the prime temptation for us humans throughout our story. the one who would save his life will lose it; but the one who – for my sake – loses his life, will find it. Here is a story of resurrection faith. The Living in The Story readings for this week juxtapose the Binding of Isaac with the Passion of Christ because this way of reading provides an important and intentional theological perspective on the Isaac story. Consider Jesus as the beloved son. For Jesus, however, there was no ram in the bush; he truly died on that cross. He died as a human knowing that when people die, they stay dead. Even so, Jesus died holding onto a tenacious, stubborn, absurd resurrection faith, a faith so grounded in the faithfulness of God he believed God’s promise could never be annulled. Ever since, followers of the Christ – theologians and scholars, mystics and dreamers, those from the academy and those from the desert – Christians still grapple with the mystery: What does this mean? In recent years, I’ve been influenced by two creative conversation partners: Jürgen Moltmann and Alan Lewis. Jürgen Moltmann’s theology comes under an intriguing title: The Crucified God. For Moltmann, God did not orchestrate the crucifixion from a distance. Rather…In the incarnation, it is God’s own Self who has entered into the human experience. And in the cross, God has entered into death itself. I can hardly get my head around that idea. Maybe God took death into God’s own Self so that God’s own life that is unstoppable and God’s own love that is unconquerable could absorb and extinguish death itself. That is an unfathomable mystery of the cross. The community of God in the Trinity takes on death and overcomes it in the overflow of love. This is the basis of our justification, the ground of new, divine possibilities for the sick and sinful, the dying and the dead. In justification we hear God’s “Yes” and we become what we hear; we are redefined by the gospel’s “word of the cross,” which pronounces us forgiven and renewed. It is the same creative Word by which God raised the crucified Jesus from the grave that has from the beginning summoned existence out of nothing. It is a word not abstractly spoken at a distance, but a Word embodied in a fleshly act of divine identity with the god-forsaken, the judged, and the dead themselves. Who is this God who would ask such a thing of Abraham and Isaac? we wonder. I daresay it is the same God who – from the foundation of the earth – is and always has been a God of divine Self-giving. Abraham and Isaac never knew Jesus of Nazareth, but as they walked toward the Mount of Moriah they were propelled by Jesus’ same resurrection faith. And what they discovered is that the One who gives, the God who loves, the Lord who provides was already there. Alan E. Lewis, Between Cross and Resurrection: A Theology of Holy Saturday (Grand Rapids: William B. Eerdmans Publishing Company, 2001) 256. Jürgen Moltmann, The Crucified God (Minneapolis: Fortress Press, 1993) 225. When my kids were Isaac’s age, I would have killed for them. Really. But kill them? Inconceivable. Did you see the film “The Passion of the Christ”? The visual that will never leave me came when Jesus hung on the cross, and as he was dying, a tear dropped from Heaven. Thank you for Alan Lewis’s words; I’m still struggling to make sense out of the Cruxifixion, and particularly the doctrine of Jesus’ sacrifice, and that quotation helped. Alan Lewis helped me SO much. I love his insights. Yes, I saw The Passion and I still have mixed feelings about it. Next Next post: As You Read. Week 5. Isaac.